The Alert Fire Co. No. 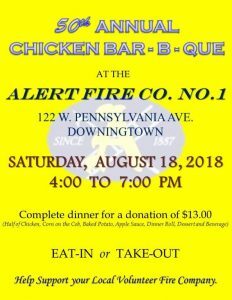 1 will host our 50th Annual Chicken Bar-B-Que and Bake Sale Fundraiser on Saturday, August 18, 2018. Dinner will be served from 4:00 PM to 7:00 PM and you can either eat-in at the firehouse or take-out. Advanced tickets can be purchased at the firehouse on any Wednesday evening between 7:00 PM and 9:00 PM. 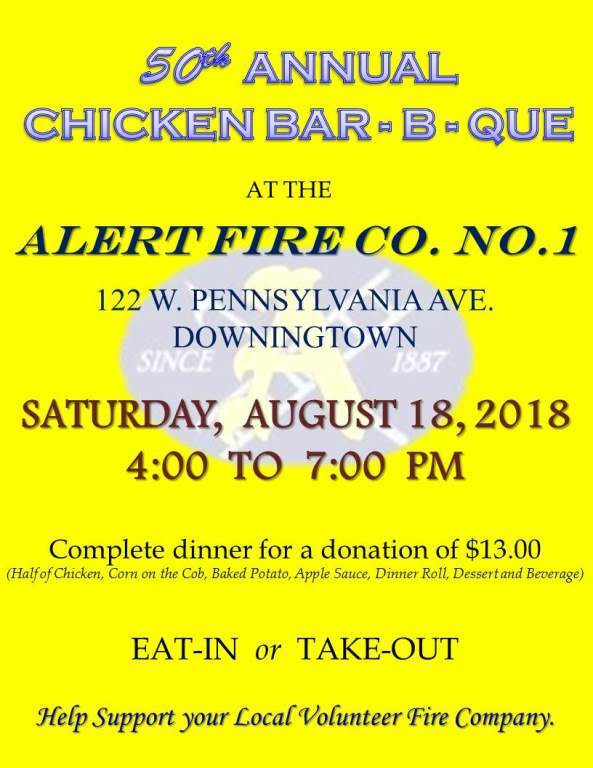 The dinner will include a hearty half of chicken, a baked potato, corn on the cob, apple sauce, dinner roll, a drink and a dessert, for a donation of $13.00. Due to hard work of our BBQ Committee, we are able to keep the price, the same for six years now! 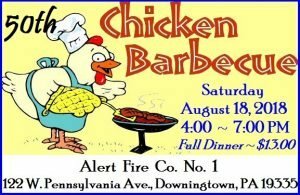 Please stop-by and support your 100% volunteer fire company with our largest fund-raiser of the year. This is a great way for our neighbors to socialize with each other and to meet some new friends.